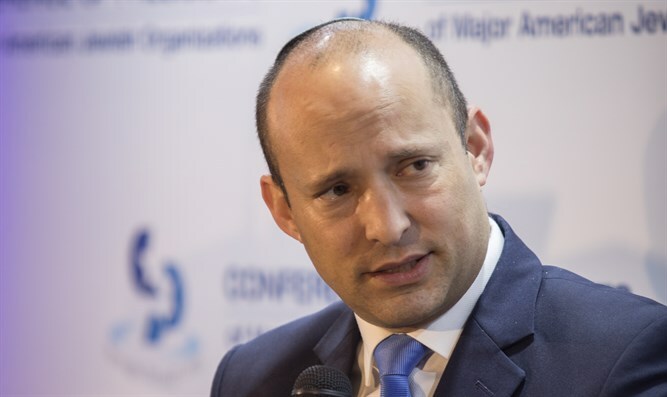 New Right party platform opposes giving away land, supports increased construction in Judea, Samaria, J-lem, applying sovereignty in Area C.
In the document, drafted by ministers Ayelet Shaked and Naftali Bennett, the party commits to refraining from handing over territories, and instead to significantly expand construction in Judea, Samaria and Jerusalem. "We oppose the handing over of our land and the establishment of a Palestinian state in the heart of the Land of Israel. We stand by the value settlement in all parts of Israel, including Judea and Samaria. Jerusalem, the united, is the capital of Israel - we will work to renew the building within united Jerusalem and to realize the potential of Givat Hamatos, Har Homa, Pisgat Ze'ev, the City of David and other neighborhoods ... In Samaria and Judea there is enormous potential for building, and we will work for free construction, which will enable the doubling of the Jewish population in the area. " The New Right intends to apply Israeli sovereignty in Area C and grant Israeli citizenship to tens of thousands of Arab residents in the area. "The residents of Judea and Samaria are not treated equally in terms of construction and property rights ... We support the application of Israeli law to the territories under Israeli control."